The John J. Willaman Center is like a giant tree house, extending high up into the tree canopy, while simultaneously looking down over the gardens. It is a most spectacular garden sculpture, the form of which reinforces its identity and function. Thus, in so many ways The Center is the lens through which we understand and see into the gardens. 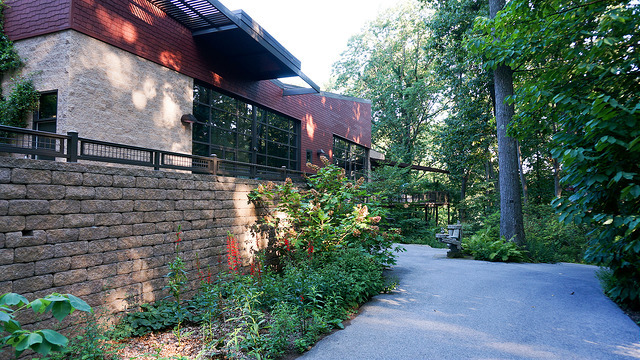 Jenkins Arboretum & Gardens is a garden for all seasons, and the architecture of this “building”, with its walls of windows facing the gardens and connecting with their natural splendor, allows visitors to fully enjoy each and every season from the inside, as well as out. 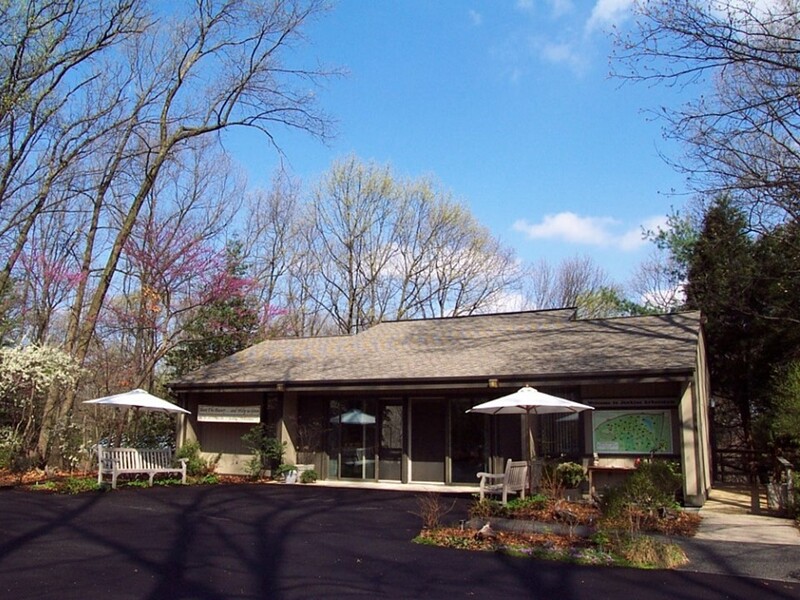 Jenkins Arboretum & Gardens was closed for one year for the construction and expansion of our previously existing small building. For geographical, as well as financial practicalities, the old building was “cocooned” within the new structure. As such, the design and construction of the Education Center comprised a project that is primarily characterized as a rehabilitation and addition to an existing building. The designer for the new building was Architect Cee Jay Frederick of Cee Jay Frederick Associates in West Chester, PA. 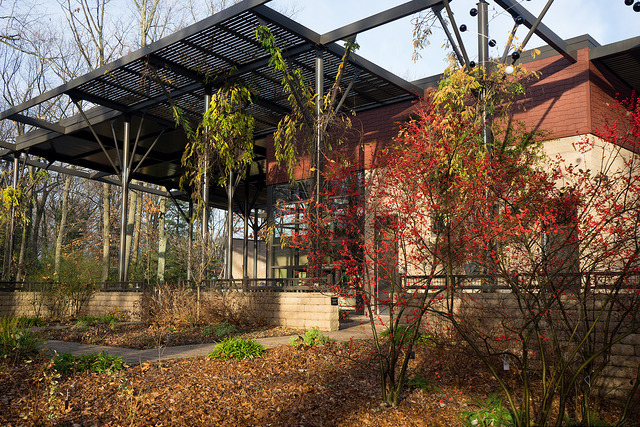 It is apparent that the design intent for the John J. Willaman Education Center building was predicated upon it taking its rightful place among the trees, fitting in amongst them, akin to the placement of a “tree house”. In fact, features like the building’s tree-branch form steel columns and the filtered canopy lighting effects provided by the extensive functional deployment of louvers reveal its hope to become, itself, one of the trees in the forest. The building has the distinction of being LEED Gold Certified. LEED (Leadership in Energy and Environmental Design), an internationally recognized green building certification system that measures how well a building performs in the areas of energy savings, water efficiency, CO2 emissions reduction, improved indoor environmental quality, stewardship of resources, and overall sensitivity to environmental impacts. LEED certification is offered by the U.S. Green Building Council, a non-profit organization of leaders and experts in the field of green building design. LEED is a voluntary certification program, and can be applied to any type of building, from schools to office buildings to homes, at any stage in the life cycle of a building. LEED promotes a “whole building” approach to sustainability. One of the environmentally fascinating features of the building is its geothermal heating and cooling system, which includes twelve 365 feet deep wells. Water is circulated through a loop configuration of plastic pipe, such that during the heating cycle, water circulates through an underground loop, extracting heat from the earth, which is at a constant temperature of 57 degrees Farenheit. The heat energy is transferred to the geothermal heat pump, which compresses the extracted heat at a higher temperature and ultimately delivers it to the building in the form of warm air through a normal duct system. For cooling, the process is simply reversed. Because the earth is much cooler than the air temperature on a hot day, the geothermal system removes heat from the building and deposits it into the ground. The fluid is cooled by the ground temperature and returned to the heat pump for cool air distribution in the building. The ERV’s (Energy Recovery Ventilators) bring in fresh air, while recovering the energy (hot or cold temperature) from the pre-conditioned air inside the building. The Center at Jenkins Arboretum & Gardens is open 365 days a year from 9am – 4pm; so, the public can come visit in every season and experience the vistas from our “tree house” looking over the acres of beautiful gardens and venture out to walk the paths for up-close enjoyment of our world class collection of rhododendrons and azaleas, as well as our perennial native wildflowers. After all, It’s really all about the gardens! CEE JAY FREDERICK received a Bachelor of Science in Landscape Architecture from Rutgers University, a Master of Landscape Architecture from The Harvard Graduate School of Design, and a Bachelor of Architecture from Drexel University. He is the principal designer in the firm of Cee Jay Frederick Associates (www.cjfa.com), Design and Planning Consultants, located in West Chester, PA. This exhibition is open to all. Members as well as non-members are encouraged to participate. All photographs MUST have been taken at Jenkins Arboretum & Gardens, preferably within the past few years. All styles will be accepted, and will be assigned to one of two categories – “Close- ups” and “Open”. Submission may be any size. All artwork must be framed and ready to hang in a presentation that conveys professionalism, though judging will be based only on the quality of the image. 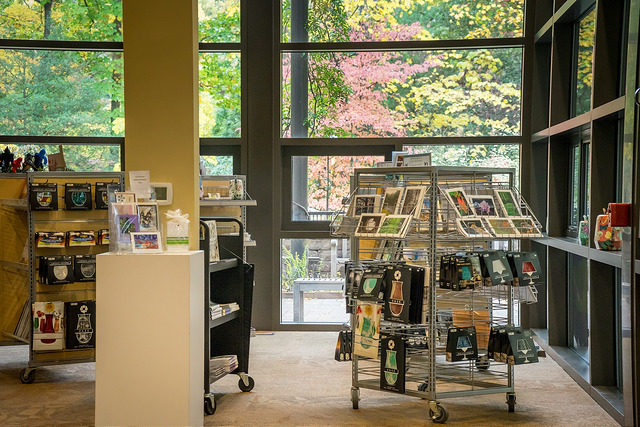 Submissions MUST be delivered to the Arboretum any time between 9:00 am and 4:00 pm from Monday, Feb. 5th through Friday, Feb. 9th. No submissions will be accepted after Friday, Feb. 9th. Please include an entry card with each submission. We must limit submissions to 5 per applicant. Members: $10 for the first submission and $5 for each additional submission. Non Members: $20 for the first submission and $10 for each additional submission. Photographers may choose to make their work available for purchase, but this is not a requirement. All sales must be handled between the photographer and the purchaser. Photographs that are sold must still remain on display until the conclusion of the exhibition. Judges will select a first, second and third place in each category and monetary awards will be given for each. The amount of these awards is $100 for first, $75 for second, and $50 for third place. In addition to the recognition and monetary award, the winners of each category will be invited to present a slideshow at the closing reception. This slideshow allows winners to show selected photographs from their entire body of work. A closing reception will be held from 2:00-4:00 on March 18th and will include a Juror’s Talk and the winning artist’s slide show. season, but what on earth is there to see in the winter? There is more than you might realize. Many have written about plants with winter interest ranging from those with beautiful bark and interesting form, to evergreen foliage and yes, even flowers. There is more of course; mother nature frequently graces us with a blanket of snow or thin coating of ice, and though it doesn’t make getting to the Arboretum very easy, the view of the untouched winter landscape makes it worth the effort. This article, however, goes beyond the beautiful and into the functional as the Arboretum becomes a sanctuary for overwintering birds. Winter is a fragile time for birds; most do not migrate and, without insects to feed on, food gets scarce. They still need enough fat and calories to keep themselves going through winter and the Arboretum provides for them a much-needed smorgasbord. Scattered throughout the gardens are hundreds of plants that provide an abundance of seeds and berries for these overwintering birds. Many of these berries are, in fact, quite beautiful. The bright red berries of American holly contrasted against its dark, evergreen foliage is a striking, classic landscape feature. The waxy blue berries of red cedar and bayberry create a subtle blue haze as seen from the distance. Winterberry holly berries, with all of their forms and color variations are lovely covered with cardinals and a thin layer of snow. Red and black chokeberries as well as highbush cranberries can be seen all through winter as they sweeten with time and give the birds something to snack on only after they’ve plucked the bounties from all of the others. Bright purple beautyberries and bright pink coralberries form in clusters along long, arching stems. Hawthorns and crabapples are adorned with hundreds of small red fruits that dangle from their branches like holiday ornaments. Rose hips can be found on several of our native beauties and sumacs display much underappreciated clusters of fuzzy red berries. The fruits, the bark, the forms and the flowers, all against an evergreen backdrop of rhododendrons and hollies makes Jenkins Arboretum & Gardens a special place to visit in wintertime. While you are here, watch for the birds through the deciduous forest. The cardinals, nuthatches, finches, wrens, chickadees and titmice will lead you to their favorite winter fruits. We hope you’ll enjoy them as much as they do.